Set on the banks of the River Thames, the Mercure London Staines Hotel is just a short drive from central London. Guests can enjoy a carefully prepared meal in the Riverside Restaurant, which serves local British cuisine with a stunning river view. 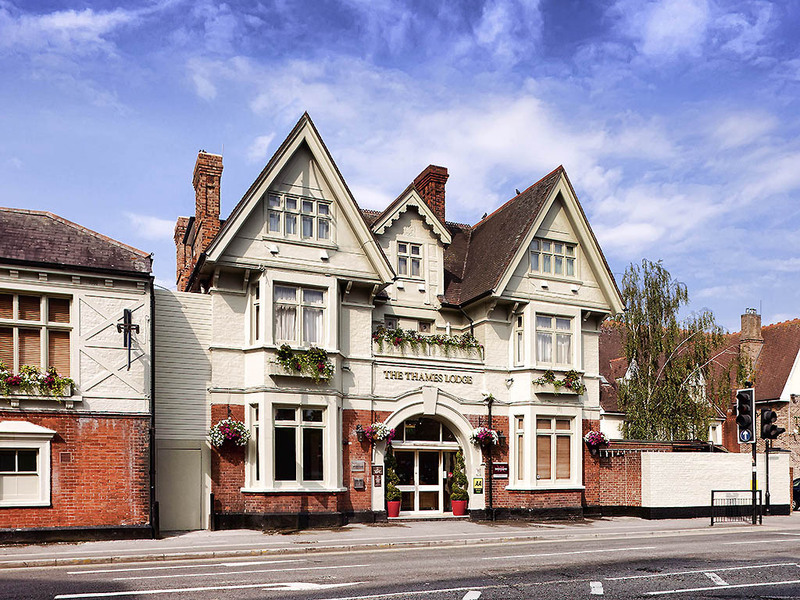 Conveniently located within walking distance of the town centre, the hotel is also close to a variety of family attractions including Thorpe Park, Legoland and Chessington. The unique hotel offers free mooring to those arriving by river boat, so guests can step ashore into immediate comfort. The Conservatory room boasts fantastic river views and can host up to 40 guests for various functions. Guests of the Mercure London Staines Hotel can relax in the traditionally decorated bedrooms, and can even enjoy a bath overlooking the river. Mercure London Staines Hotel is conveniently located 1 mile from the M25 in the heart of Staines town centre. Heathrow International Airport is only 5 miles away. The Mercure London Staines has 88 beautifully appointed bedrooms with many of our feature rooms overlooking the river Thames. All of our bedrooms are en-suite and contain a minibar, 32 inch flatscreen TV, telephone and tea & coffee making facilities. All of our bedrooms are en-suite and contain a mini-bar, 32-inch flatscreen TV, telephone, and tea and coffee making facilities. The Riverside Restaurant invites you to sample the very best in food and beverage. Choose from a wide range of traditional and international dishes, prepared from only the freshest and highest quality ingredients. The Riverside Bar is ideally located adjacent to the River Thames and serves a full range of hot & cold dishes and drinks. Why not enjoy a Latte on the Terrace when the sun is out? Rooms dated and in need of a refurb.2 lights not working in the bathroom. Hotel was old and clearly hadn't been remodeled in years. Carpet was coming up, paint was chipped, decor was old, heat was via a plugged in radiator. One day my room wasn't even cleaned despite me being gone for 10 hours. Room service dishes took forever to get picked up in hallways. Normal amenities (conditioner, lotion) not given. The hotel needed a lot of updating , some of the rooms were in need of a good paint and some renovations. Not enough pillows or towels. steep stairs and no elevator. Not the usual Accor standard. The Mercure makes a nice base camp for doing business in the area, including commuting into London. The staff are very friendly and helpful, and sandwiches are available later in the evening, if one came back from London a bit late. great location friendly staff rooms are a little tired however they are very clean , had some confusion as room was set up with 2 single beds when i asked for a double , Room also seemed to be set up for one person when there was myself and my wife , when i mentioned this at reception the staff were very apologetic and a compromise was reached with no fuss at all . This is a hotel of two halves, part of it is nice, restaurant and some rooms, however other areas are old and shabby and definately in need of a coat of paint! It also have no lift. After being shown to a tiny shabby room with no room in the wardrobe to hang a couple of dresses and a chair that was so worn and looked like it hadn't been dusted in years I was moved to another room which albeit the mattress was too big for the bed which meant the chair didn't fit under the dressing table it was perfectly suitable. We stop every year in your hotel to break the drive North from Gatwick after a night flight from the US. We have a dog with us and your location next to the Thames path makes walking her a pleasure. Staff very friendly and attentive and food and room satisfactory. The room was great and service as usual was spot on. However I did hear a regular mechanical noise all night every 15mins or so, like a lift noise but I don't believe there is a lift next to the room. It was very loud eventually I managed to fall asleep in spite of the noise. Easy check in. Friendly staff. Good location. Needs renovation. Disappointed at being given a disabled room, felt like a care home instead of holiday. Kettle element was disgusting and made me feel sick when I realised I had used it for a couple of days. Staff changed it. Electric fire stopped working on my last night. Although I have a choice I will stay again hopefully with a better outcome.